DiamondPoolTables.com have taken the time to ensure a safe and secure purchase. Buy with confidence that your personal information is safe. All purchases are processed through payment gateways that manage the complex routing of sensitive customer information through the credit card and electronic check processing networks. Payments are processed with strict industry standards for payment processing, including: 128-bit Secure Sockets Layer (SSL) technology for secure Internet Protocol (IP) transactions. DiamondPoolTables.com has even went one step further to ensure that the purchase is not only safe for the customer but, ensures that the credit card used is being used by the owner of the card and not by a person committing fraud! 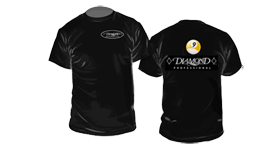 DiamondPoolTables.com only accept Genuine orders from Genuine customers. Fraudulent orders will not be processed and the credit card company will be notified immediately.